Do you want to use your excess solar energy rather than giving it to the Electricity Companies? Then CATCH Power is for YOU! 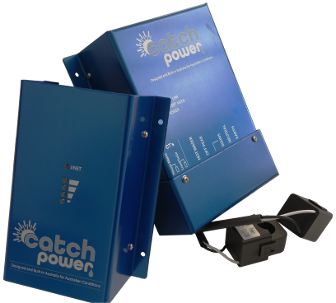 A CATCH Power device uses your existing solar installation to heat your hot water. They are fully designed, engineered and manufactured in Australia for Australian conditions! Don’t give your excess solar away for free. CATCH will take the excess solar and use it to heat your hot water. There are significant savings to be made by making better use of your solar electricity. Will CATCH work with gas or heat pump hot water? No. CATCH utilises pulse width modulation to regulate power, as such it only works on resistive element hot water systems. Will my existing hot water tank work? Yes. CATCH will work with your existing hot water element and thermostat. All that has to happen is to install CATCH. Do I need to change anything with my solar array? No. CATCH will work with your existing solar array. CATCH gets installed into the meter box and all of the magic happens from there. Will CATCH work without an internet connection? Yes. Green CATCH is specifically designed to work independent of an Internet connection. 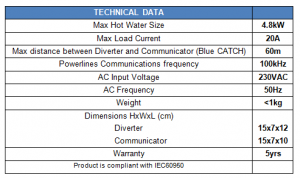 Does CATCH work on 3 phase solar? CATCH is only capable of monitoring one of the 3 phases, so yes it will work but not as effectively as it could. A 3 phase version, Red CATCH, is coming soon. How far apart can the diverter and communicator be? That all depends on how much noise is present in the cabling of the house, but we have installed the devices up to 60m apart in very noisy environments and it all works. Is my solar array big enough? CATCH works on any size solar array. The table below shows approximately how much hot water will be heated from your solar. 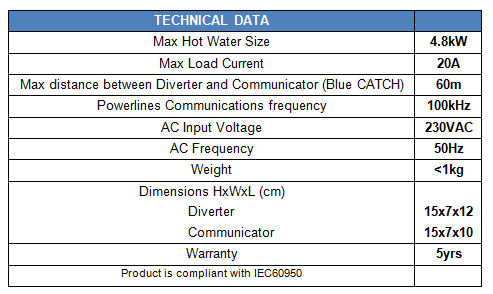 *The figures above are estimates only; there are many factors that may affect the amount of water heated. I have Off Peak Hot water so I don’t need CATCH..right? It is true your hot water is cheaper than those paying full price, but with CATCH installed you will still make huge savings, in fact CATCH is so smart it will automatically know you have off peak and will use it when there is not enough solar to do the job. If I have CATCH can I get rid of my Off Peak meter? Yes you can. Once CATCH is installed there is very little need to have off peak especially if you have a 3kW or larger solar array. By getting rid of your off peak meter and moving to Time of Use tariffs you may save much more than you think. You don’t need to worry about your hot water heating on peak rates; CATCH is smart, it knows when the off peak periods are and if your solar cannot finish the heating CATCH will use off peak times to finish the job. Green CATCH is always assessing how much off-peak has been used and adjusting to maximise the use of your solar. Green CATCH is simply a diverter of solar power that is excess to your household. CATCH gets installed into the Meter Box. CATCH monitors power coming and going from your premises; when the diverter senses power leaving it redirects that power to your hot water service. The user adjustable dial, located in the meter box, enables you to adjust for the amount of off-peak power that is used each night. 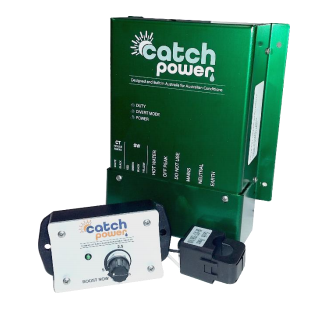 Green CATCH will automatically adjust the timer set to make the best use of your solar. It learns every day. The user adjustable dial can be adjusted to heat water immediately (from general tariff electricity) to never using the mains at all. Great if you are going on holiday! CATCH Power devices use an adaptive learning algorithm to ensure optimum use of the generated solar. For even greater control and online monitoring consider Blue CATCH as an alternative. How does user adjustable dial work? The control over your hot water is right here on this dial. Simply adjust it through the seasons to maximise the amount of solar that is used. So just set the timer and that’s it? Not entirely… Green CATCH is always looking at the conditions and when the hot water has reached cut-off. If it happens too early in the day then CATCH will automatically adjust the timer (internally) so as to be as efficient as possible. What if the hot water doesn’t reach cut-off through the day? CATCH is always working, and checking; if your solar develops a problem, CATCH will notify you before you even know there is a problem. CATCH comes in two parts, the Diverter and the Communicator. The Diverter gets installed into the Meter Box. The Diverter monitors power coming and going from your premises; when the Diverter senses power leaving it redirects that power to your hot water service. The Communicator plugs into a power point next to your internet router, then it connects into your router to get access to the internet. The Communicator passes information from our Cloud servers to the diverter and takes data from the diverter and sends it to our Cloud servers. The Communicator and Diverter use the existing premises electrical wiring to communicate, there are no extra wires needed. CATCH Power devices use an adaptive learning algorithm to ensure optimum use of the generated solar. Our Cloud Servers take the data received from CATCH and combine it with weather forecasts; the combined data is used to optimise the use of your solar. There are no complicated settings to deal with, just plug it in and let CATCH work the rest out. Why does CATCH want an Internet connection? The Advanced control algorithms are constantly looking at the weather for tomorrow in order to make the best decisions about how to heat your water today. We constantly communicate with the weather forecasters at your location to make this happen. One of the benefits of having an advance control algorithm heating your hot water is it can also be looking at your Solar system and letting you know if it thinks there is a problem. We use the Internet to send an email to our technical support team and to you if CATCH finds a fault in your solar system.